Major League Baseball is taking the challenge. The goal is 30 teams in 30 days, hitting every ballpark across the country during the month, with each major league team accepting the challenge from the team before them. Washington Nationals players Tanner Roark, Danny Espinosa and their wives took the Ice Bucket Challenge on Aug. 4, accepting the challenge from the Houston Astros. 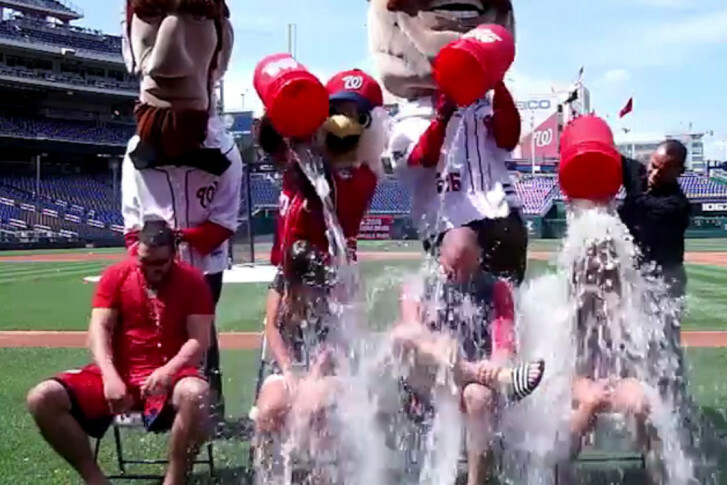 The Racing Presidents, along with Screech, the Nats mascot, helped dump ice water over the heads of the players and the their wives, who then challenged the Los Angeles Angels. “We’re extremely grateful to Major League Baseball for stepping up this year and supporting the ALS Ice Bucket Challenge,” said Brian Frederick, chief of staff at the ALS Association in Washington, D.C.
Major League Baseball (MLB) has a long history with ALS (Amyotrophic lateral sclerosis) because of Lou Gehrig,” Frederick said. ALS is often called Lou Gehrig’s disease. Gehrig was a Hall of Fame MLB player who played first base for the New York Yankees (1923-1939). He was diagnosed with ALS in 1939 and died in 1941. Frederick said that last summer’s ice bucket challenge became a global phenomenon raising $220 million dollars around the world and $115 million dollars in the U.S.
“That’s enabled us to triple the amount of money we spend on ALS research and increase funding for our certified treatment centers of excellence for people living with ALS,” Frederick said. He added that bringing a new treatment to market could cost a couple billion dollars. “So we’re really hopeful that people will take round two and get involved cause we still have a long way to go to in this fight,” Frederick said. ALS is a progressive nervous system disease that’s fatal. It leads to paralysis and death within two to five years of being diagnosed. There’s no cure and only one drug (with FDA approval) that slightly extends a person’s life. The ALS association said it is not sure why, but veterans are two-times more likely to develop the disease compared with the general public.